We welcome Hitachi's decision to freeze its Wylfa Newydd Nuclear Project - Now Hitachi and Japan should pull out of nuclear power completely! Now Hitachi and Japan should pull out of nuclear power completely! Today at Hitachi’s board meeting, it was decided to freeze its Wylfa Newydd Project, a project of Hitachi's subsidiary, Horizon was planning to build new nuclear reactors in Wales, the United Kingdom. 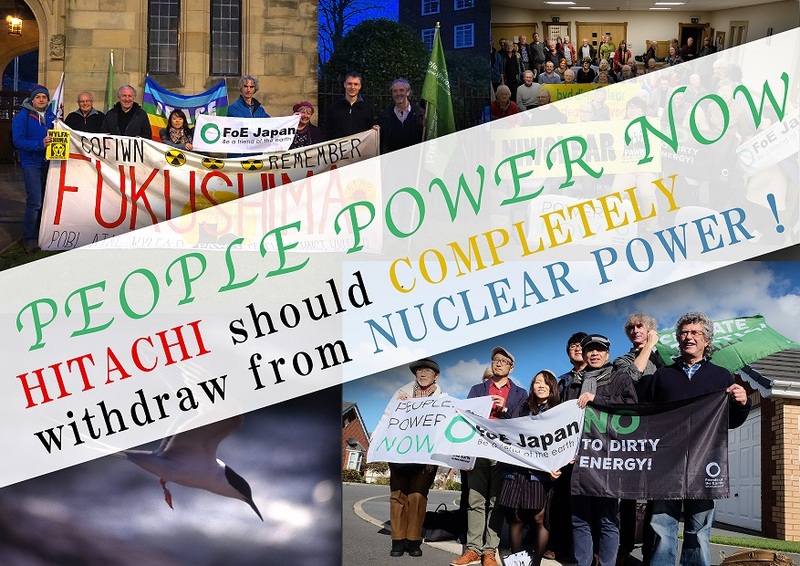 The environmental NGO, Friends of the Earth Japan and the local anti-nuclear group, People Against Wylfa B (PAWB) welcome this decision, and furthermore demand Hitachi to completely pull out of its nuclear power business. Nuclear power places residents at great risk of accidents, and will contribute to unsolvable nuclear waste problems for future generations. Due to such danger of nuclear power, PAWB has been protesting against the project, and voice their concern that the project would ruin the beautiful nature and distinctive culture of the Isle of Anglesey. The most questionable aspect of the Wylfa project was its economic feasibility. The strike price of the electric power from the Hinkley Point C nuclear power plant, a power plant that is currently under construction in the U.K., was twice the average market price. Based on this case, a high strike price was going to be essential in order to make the project economically feasible. Furthermore, both the Japanese government and the U.K. government were expected to support it with public funding. When the media reported that Hitachi would take a loss of 200 to 300 billion yen, Hitachi’s stock price rose. This indicates that the market also observes the project as very risky. One of the major reasons Hitachi suspended the Wylfa Newydd project was that they could not find investment partners to reduce the possible risks that they would have to bear. Tokyo Electric Power Company (TEPCO), Japan Atomic Power, Chubu Electric Power and the Development Bank of Japan were mentioned as potential investors. Considering the fact that TEPCO has not yet provided enough support to the victims of the nuclear disaster they caused on March 11, 2011, it is surprising that TEPCO was even mentioned. In the end, they concluded that the project was also too risky for them to be involved in. The risks associated with nuclear power are not only limited to the Wylfa Newydd project, but all nuclear power plants in general. We have learned from TEPCO’s nuclear disaster that we cannot quantify the loss that people face due to nuclear disasters - the loss of their livelihood, their loved ones, and even the will to live. The government calculated that the cost related to the TEPCO nuclear disaster would now rise up to 22 trillion yen. TEPCO would have had to file for bankruptcy without the governmental system to financially support them. Since the nuclear accident, the government has begun to consider the costs associated with safety measures, which used to be completely externalized. However it is still not enough. In Japan, public polls always show that the majority of citizens are still against nuclear power. It is also clear that the nuclear fuel cycle is not feasible. People no longer believe the narrative that nuclear power is cheap, or that the country is short of electricity. We should stop using nuclear power for the benefit of a small number of people. We need an immediate nuclear phase out, and should instead spend money to support the nuclear victims and to shift to sustainable energy. We demand Hitachi, the government of Japan as well as the government of the U.K. to fully withdraw from nuclear business and the building of any new nuclear reactors, and instead, invest in more economically viable, safer, and renewable options.